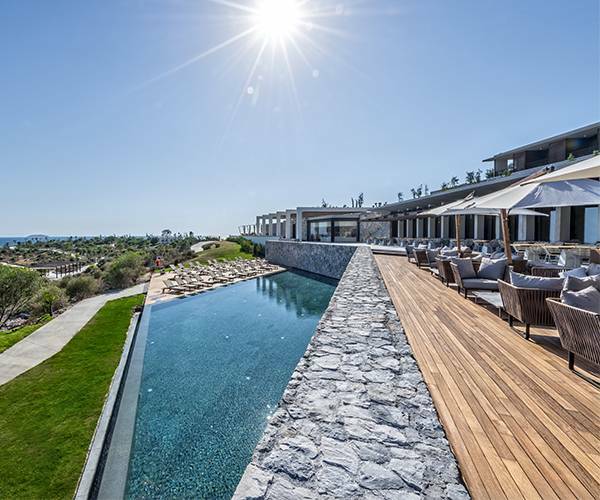 Set on the breathtaking of the Aegean coastline, Six Senses Kaplankaya blends world-class contemporary design, natural beauty and the rich history of this renowned region. All guestrooms and suites boast stunning views to the Aegean Sea, and the spectacular resort is within easy reach of famous archeological sites, including two of the Seven Wonders of the Ancient World. Kaplankaya’s Six Senses Spa offers guests personalized integrated wellness programs, performed by recognized wellness experts and practitioners who guide guests towards their optimal wellbeing. The spa’s facilities include an indoor swimming pool, Watsu pool, hammams, beauty salon a hydrothermal area, state-of-the-art fitness studios and classes – and much more. And with families in mind, Six Senses Kaplankaya also offers popular activities from yoga to basketball at the Kids’ Club, along with outdoor and indoor family activities and tours. Six Senses Resorts are known for healthy, fresh and delicious food and Kaplankaya is no exception. The resort’s expert chefs serve Mediterranean-inspired, locally sourced, sustainable cuisine inspired by classic Turkish techniques and flavors at three gorgeous dining venues. At Six Senses Kaplankaya you will discover a meaningful program tailored to your wellness needs in one of the world’s most beautiful settings – which is exactly what a dream vacation should be. Your journey to wellness begins with a non-invasive health screening to measure your key physiological biomarkers. Six Senses Kaplankaya experts then use the results to create a personalized program tailored for your individual health needs, focusing on sleep and nutrition, movement and mindfulness. During your stay, curated spa treatments from massage to facials to wellness therapies help you feel your best every day. And diverse facilities from an indoor swimming pool, Watsu pool, the signature hammam, an authentic Turkish rasul, beauty salon, state-of-the-art fitness center and an extensive hydrothermal area add up to the perfect integrated wellness experience. In addition to its spectacular setting, lush accommodations, fresh, healthy cuisine and the luxurious spa, Six Senses Kaplankaya offers a wide array of activities for all ages and tastes. Water sports, beach activities and hiking take place in a private and secluded setting and there are numerous opportunities to discover the area’s rich local culture, natural beauty and history on excursions created with sustainability and the environment in mind. (Choose from tours of the Bodrum Peninsula and its spectacular coastline, the Bodrum Museum of Underwater Archaeology, the Mausoleum at Halicarnassus and more.) The Kaplankaya area is also glorious underwater, and during your stay be sure to take time for a dive. In addition, there is a popular Kids Club and a host of activities for families and groups traveling together. All rooms offer floor-to-ceiling windows with superb views of the beautiful Aegean Sea, along with a private balcony and desk and dressing areas separated from the sleeping area. Spacious marble bathrooms have a separate shower, a large soaking tub and bathroom amenities by The Organic Pharmacy. You will also find a yoga mat, beach bag and flip-flops in your room. And if you’re looking for larger accommodations, choose a junior or master suite or the luxurious Seaview Kaplankaya Suite with Pool. 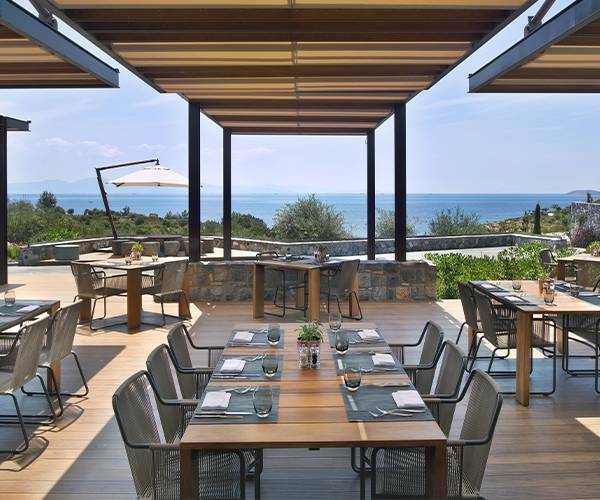 Each of Six Senses Kaplankaya three dining venues features the ‘’Eat With Six Senses’’ concept featuring local and freshly picked ingredients from the resort’s own organic garden, along with with offerings from the local fish market and nearby villages. The resort’s talented chefs create Aegean and Mediterranean-inspired fresh, sustainable cuisine highlighting Turkish elements and flavors. Restaurants include the Sage & Sea Restaurant and Bar, Wild Thyme Restaurant and Bar and Meza by the Sea, along with three bars for relaxing and socializing.